A selection of Keep The Scenic Rim Scenic’s extensive collection of protest banners have been included in the Queensland Museum latest exhibition “Collectomania”. Tracey Larkin, committee member of Keep The Scenic Rim Scenic (KTSRS), attended the official launch at the museum on Wednesday 27th March to represent the Scenic Rim community group, and view the installation of the banners. Collectomania features 65 Queenslanders who have a significant collection of objects. The collections range from fun, inspirational, revealing and serious. What is common is that all collections have strong stories associated with them, show how how the State’s collectors gain meaning and identity from their collections. The KTSRS banners are representative of the 1000+ people who took part in the Protesters on Peaks community action in October 2011. On one day these protesters climbed the significant peaks within the Scenic Rim with giant protest banners to be part of a visible helicopter fly-over which captured the essence of the Scenic Rims natural environmental assets, as well as uniquely highlighted the significant community opposition to allowing coal or coal seam gas development in the region. Further banners we made and displayed during the 10-day Kerry Blockade in January 2012 where sustained community protest from hundreds of community residents at the exploration drilling site of an Arrow well, resulted in a pre-election promise from the Government to quarantine the Scenic Rim from coal and coal seam gas exploration and mining. The Hon. Dr. David Hammil launched the collection, and in his speech he said that “the collection will generate conversations about the source, and lead to better understanding”. Mrs Larkin added later that “the Collecomania exhibition will generate courageous conversations about the the possibility and success of community being able to say “no” to CSG, and Collectomania will take this conversation to a wider Brisbane audience”. See the collectors blog here. Collectomania is on show at the Queensland Museum until December 31. Keep the Scenic Rim Scenic (KTSRS) is urging the Scenic Rim community to become involved in the wording and direction of councils new Corporate Plan after uncovering a series of serious shortfalls in the document. KTSRS has submitted a draft copy of an alternative plan (click on file above). KTSRS encourages all members of the community to read the Draft Corporate Plan, visit the informational websites in this article, read the KTSRS submission and draw their own conclusions. With only hours left to have your say KTSRS strongly urges local residents to approach councillors with feedback or to use the KTSRS alternate plan to write their own submission. It was clear what the residents of the Scenic Rim wanted when they were consulted extensively on the Community Plan. In fact this was the most engaged the Scenic Rim community has been in any community consultation KTSRS has seen. From this extensive consultation it was clear that the community values the natural environment as their top priority followed closely by rural lifestyle. But to maintain these two top priorities requires clear strategies, careful planning and strong documentation. The KTSRS submission has been based on the Sunshine Coast Regional Council and the Scenic Rim Regional Council corporate plans. Please take the time to have your say. Police offered' no evidence', after providing the defence with a copy of an Arrow Energy permit which was expired at the time of the drilling at the Silverdale site. Fantastic news for Linda and our community, many of whom regarded the charge under the Petroleum and Gas Act as an attempt to intimidate protestors. Did Arrow Energy have a valid permit, signed by the landholder, to drill at Silverdale at the time Linda was arrested? A valid permit would have been an essential part of the prosecution case against Linda. The 'entry permit', provided to the defence by police, expired four months before Arrow Energy drilled at Silverdale and related to coal not gas. With no public register of landholder agreements, KTSRS cannot check for another valid entry permit, so we're calling on mining minister Andrew Cripps to investigate. WHY DO WE WANT TO KNOW? because in 2011 Arrow Energy was fined $40,000 for breaches of the Petroleum and Gas Act,including breaches of the Landholder Access Code (which covers entry permits). Click here to learn more about Arrow Energy's 2011 breaches. 'Entry permit' agreements between landholders and CSG companies are compulsory. KTSRS has also confirmed Arrow Energy did not have the required Building Approval/Council approval when it drilled at both Kerry and Silverdale in January 2012. These are small issues, but they illustrate that, despite having the tightest of regulations, the Queensland Government does not appear to be watching what is happening on the ground. Instead it is left to community to ensure the miners comply. We are ones exposing breaches: the Condamine River bubbling gas; flammable water bores; overflowing saline, often toxic, waste water dams and sickness in the people of Tara, Qld, who are already surrounded by gas wells. Community meetings are underway across the shire - learn more about the Scenic Rim's Coal-CSG Free surveys, now rolling-out across the shire and how you can join in. 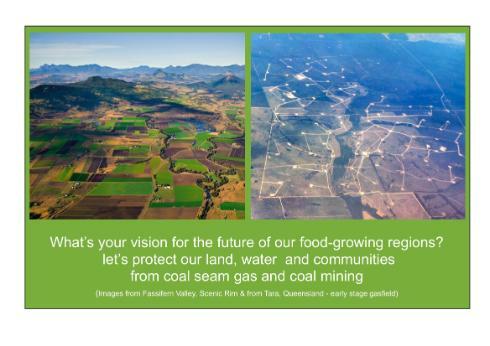 The survey asks one simple question "do you want your road and land to stay coal and CSG free?" So far, in surveys already underway Kerry Valley and at community meetings we have a 100% YES vote. 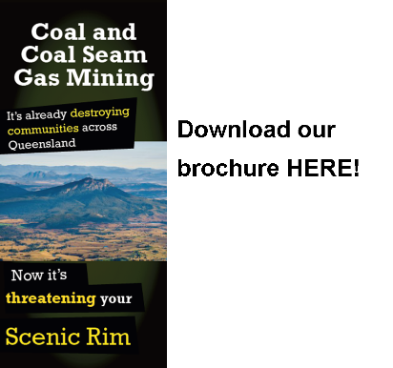 The new Queensland Government has promised to keep Coal and CSG out of the Scenic Rim - Why do the survey? The Queensland Government has recently announced that in 2014 it will use changes the south-East Queensland Regional Plan to stop mining in our region. In the interim, we are told, the mining minister can refuse new mining applications. Our legal advice confirms these provisions in the Petroleum and Gas Act and the Mineral Resources Act, BUT it also states not everything is quite so black and white. It seems mining companies also hold that view. Recently Allegiance Coal told Croftby residents and KTSRS that it sees 'no legislative impediment' to its planned open cut coal mine at Croftby. Drilling to prove and design that mine is expected to resume in October. So, in a nut-shell, we feel the best approach is to continue to stand strongly, united in our clear position that We want to stay coal and CSG Free. Our survey results will support help our local Council, State and Federal members, as they continue to push our case with the Queensland Government and beyond. This is what we're working to prevent. Here you see our productive Fassifern Valley on the left and, on the right, you can see what has already happened at Tara/Chinchilla, only a couple of hundred kilometres from us. The webs of gas wells and pipelines, an average 800m apart, extend for miles. There are currently about 3000 gas wells in Queensland - our Government wants 40,000. We can stop this in our Scenic Rim, if we stand united. 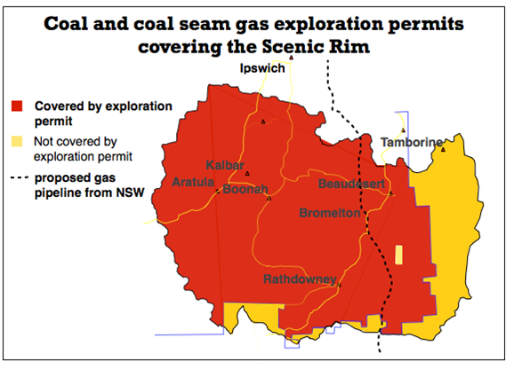 More than 80% of the Scenic Rim Shire (just south of Brisbane and tucked in behind the Gold Coast, south east Queensland) is covered by exploration permits for coal and coal seam gas. Test drilling is well underway and resource company plans are progressing rapidly, in-spite of a promise by the newly elected Queensland government that there will be no coal or coal seam gas production allowed in our region. Opposition to this mining onslaught remains firm, with concerns that if full scale mining goes ahead it will industrialise our area, destroying our peaceful rural lifestyle, jeopardising supplies of clean water and air, as well as threatening both agriculture, tourism and other existing businesses. Coal seam gas production also involves extracting significant quantities of underground water, raising fears of depletion of reserves, critical for agriculture. In the Scenic Rim, Arrow Energy has also already conducted the controversial hydraulic fracturing or fracking process (sometimes also called faccing), just south of Beaudesert, within 100m of the Logan river, which is also the source of the town's water supply. ‘Fracking’ is under a temporary ban in NSW, the UK, South Africa and parts of the US, with a permanent ban in France. Fracking is also banned in New York's water catchment while the risk to drinking supplies is assessed. Scenic Rim exploration permit holders are also eying-off our region for another controversial gas process, which has already contaminated an aquifer and livestock in Queensland. Underground coal gasification (UCG) is done under a coal permit and involves setting fire to the coal seam underground and harvesting the produced gas. We are especially concerned about Linc Energy and other permits over and around the proposed Bromelton Industrial Estate because of the potential for a UCG/CSG fired power station. The draft Bromelton Structure Plan makes provision for a privately funded power plant, so we believe this issue must be addressed and ruled out for the safety of the community living nearby and also the future of our region. What are we doing to protect our area? Keep the Scenic Rim Scenic working hard to ensure the newly elected LNP government keeps its promise to protect our region from CSG and coal mining. Prior to the Queensland election, the LNP, Jon Krause and Campbell Newman repeatedly said there would be no coal seam gas production and coal mining in our region. KTSRS remains hopeful this planned no-go zone will be maintained, however - in the face of lobbying on Government from the mining industry - we are aware of the need to continue to maintain a strong front to keep our region free of CSG and coal mining and also to secure wider protection of underground water supplies and other rural communities. We cannot match the mining company war chests, but all over Australia communities are mobilising to stop mining and coal seam gas in inappropriate areas and slow the process down to allow experts to assess the potential risks to our underground water supplies, health and wellbeing. A community working together to stand up for its rights is a powerful force. CollectOmania is on at the Queensland Museum until 31st December - see the KTSRS presence there!! Put a sign on your gate or fence - Send a clear message to passers by and your neighbours. It's important to show we're all on the same side. Get your signs for $2 and bumper stickers for $1. Click HERE to find out where you can buy them. When you've put your sign up, send us a photo for our our photographic submission to highlight our opposition to the State government. Join the Keep the Scenic Rim Scenic email list and keep up to date with the campaign. 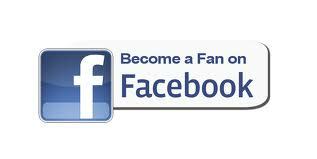 You can also be part of Keep The Scenic Rim Scenic on Facebook. This is the place where you'll find lots of new information and discussion relevant to our area and other similar campaigns across Australia. Tell people what's going on and get them involved. Email us to offer help or ask us to talk to your group. This is an expensive exercise for a volunteer community group: your support is needed for it to succeed. Help us cover more than $10,000 in costs for information brochures, up-front payment for printing of signs and stickers, other materials used at public meetings, costs of Protestors on Peaks. The labour required for this campaign is being kindly donated by volunteers. If you're interested in helping please send us an email. Every dollar you donate will help safeguard our homes, our children’s future, our farms, our food growing regions and the special place Queenslanders, interstate and international visitors come to relax, unwind and explore. Australian CSG Backgrounder: Lots of people have been asking for the link to the film we're showing at the Coal CSG Free info sessions. To watch online you'll need a bit of internet because the film goes for 39 minutes, but it is most informative. To access the you-tube version click here. You can also get a DVD at your local community meeting. The Sky Is PInk - sequel to GASLANDS from acclaimed US filmaker Josh Fox. Available online for free. 'The Sky is Pink' offers some disturbing statistics about aging gas infrastructure: we all know concrete cracks and when it is used in gas well-casings, it performs no differently. Rod Andersen's Final Stand at Kerry. When you open this you-tube, you will also find lots of the Kerry Blockade news coverage and other clips show in the column on the right hand side. Video: ABC Four Corners - Great Barrier Grief: Marian Wilkinson travels to Queensland to assess claims that at least six major Coal Seam Gas/Liquid Natural Gas export developments - either being planned or currently underway - could potentially put the Reef in jeopardy and destroy industries, like fishing, that rely on their proximity to it. 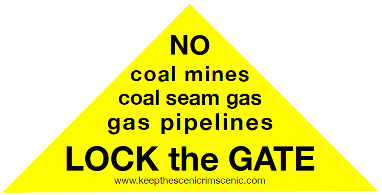 Lock The Gate: A national alliance of 90 community, industry and environmental groups fighting CSG. VIDEO: ABC Four Corners: Investigative documentary on coal seam gas mining and the cost to farmers and the environment. VIDEO: Ch9 60 Minutes - Undermined: "It's happening in our backyard. And it's our laws and our politicians who are letting it happen." Gasland Australia: See the trailer for the Oscar nominated documentary, plus the latest news on CSG. Research: KTSRS is maintaining its detailed investigations of past and planned future drilling activities in our region, including assessing Well Completion Reports as they are publicly released and checking compliance. Expert and legal input is also being sought on some issues. The you-tube clip above brilliantly sums the model - prepare for goose bumps as you see clearly the wide-reaching positive impacts that a united approach to Coal and CSG can have on communities. The Channon and Keerong pioneered the CSG-Free concept, surveying communities and declaring them CSG-Free when over 99% of residents sign a commitment to keep their properties and roads mining free. Statements and opinions contained on this website are given in good faith. In the preparation of this information, Keep the Scenic Rim Scenic has relied on information including resource company reports (available on-line), resource company and Queensland Government websites, as well as numerous other sources. We believe, on reasonable grounds, this information is reliable and not misleading, however, we are aware the resource industry is constantly changing, as are company structures and ownerships. We strongly advise you also do your own research into all coal seam gas and coal related issues and draw your own conclusions from all information available.